When word got out that the Mill Valley Schools were in need of a new music teacher to teach stringed instruments, it was Kiddo! founder Trisha Garlock who thought to call the New Century Chamber Orchestra in San Francisco. 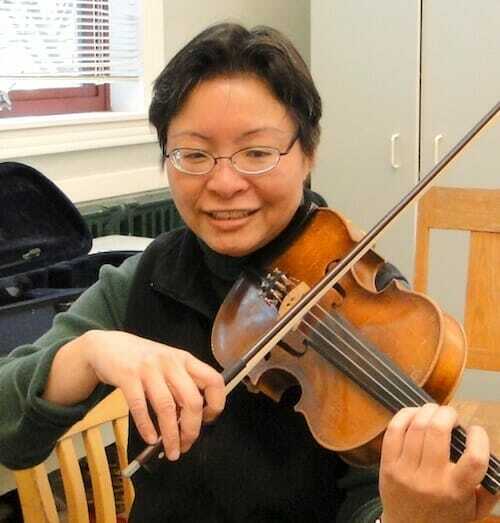 From that orchestra organization came Phoebe Dong, who, in a short time here, has proved a passionate, talented, and popular new string teacher in the district. We recently caught up with Phoebe between classes, private lessons, community projects, and her own ongoing music studies, to ask her a few questions about her background and philosophy. What were you doing before teaching here? I taught strings full-time in the Dixie School District for 17 years. In tandem, I directed string ensembles for 14 years in the Marin Symphony Youth Programs. About five years ago, I had an epiphany that I wasn’t nurturing my own musical soul enough, so I took a break from public school teaching to study piano full-time. While on leave, I became an artist faculty member at San Domenico Music Conservatory, teaching private piano students and directing chamber ensembles. I still enjoy the balance of performing and teaching. I continue taking weekly piano lessons — the violin is on the back burner — and I’m learning a lot and even playing in juried competitions for the experience. In the last year, I’ve served as Education Coordinator for the New Century Chamber Orchestra in San Francisco. I enjoy the NCCO job because it helps me reach underserved students in Marin who might otherwise be denied an opportunity to study music. My job is to support and mentor gifted violinists interested in teaching who also have a strong desire to work with underserved students. I also serve on the Board of Directors for the Music Teachers Association of California, Marin branch, which decides policies for a professional network of private music teachers in Marin and raises scholarship money for disadvantaged students. There are always kids who are left out of music. Music study can be expensive and parents can overlook it while they’re trying to survive. It is my hope to bring those kids to music. What are you teaching currently? I teach two string orchestras at Mill Valley Middle School, as well as two chamber ensembles, each a string quartet playing music by composers such as Haydn and Mozart. I also teach all the violin, viola, and cello students in 4th and 5th grades at the five Mill Valley School District elementary schools. And I have a private violin and piano students. There is an endless amount of creativity in a music classroom. I love teaching music and teaching so many other things with it. When school districts ignore music, they miss the potential of bringing different disciplines together and teaching other subjects in a creative and wonderful way. At MVMS, I started to align the 6th-grade music curriculum with social studies by doing a unit on Chinese music. I taught the students the Chinese pentatonic scale and the way you can combine different notes in that scale to create melodies, much the way you would do with a blues scale. They each went home and wrote a piece of Chinese music. I told them to come up with a poetic title for their piece that reflected an aspect of nature, because nature is a very symbolic aspect of Chinese music and art. It was very successful, and I’d like to try this with 7th and 8th graders too when I find the open time. I’m also really interested in doing more collaborative work with other ensemble groups at MVMS, where Cayce Carnahan currently teaches many band ensembles. It would be exciting to be able to explore more symphonic music with Cayce utilizing strings, winds and percussion. This fall, we combined strings, woodwinds, brass, percussion, and chorus for a piece called “Zombie Jamboree”. It was really fun to work with the large ensemble. The real creativity breaks loose when you start collaborating outside your department, such as when the MVMS chorus and drama departments come together to create the musicals. A lot of different disciplines can be put together. What else keeps you going? I have faith in the system and kids. I’m also very proud to be working with an extremely talented and caring music staff that inspires me daily. As long as there are hungry kids who are curious and excited about music, I’ll have the energy to feed that hunger. We talked about your work with underserved students. What drives you in that area? I am passionate about music education because as a child, I felt the injustice of seeing wealthier schools receive adequate funding for good music programs, while poorer schools like mine suffered. I was raised in a close-knit working-class family in Sacramento, where my parents, who were from China, ran a mom-and-pop store. Money was tight, but in spite of our financial limitations, my parents always made it a priority to give me music lessons. When my mother was a little girl in her village in China, she was taken out of school in 5th grade to help with the cooking and cleaning. Even though she begged for music lessons, she couldn’t have them, and she vowed to give them to her children. My two older brothers never had the opportunity to play music, so when I came along, it seemed that I was the one who was supposed to get lessons. When I was 9, my older brother worked the entire summer to buy me a piano. He had intended to use his earnings to defray college expenses because he had just been accepted to Stanford. Instead, he sacrificed the money for the piano. If it weren’t for my family making sacrifices, I would have never attained my dream of becoming a musician and teacher. I am impressed by the loyal support Mill Valley parents and the community have for arts education. Kiddo!, in particular, makes impossible things a reality. Within the first month of teaching here, I met a little boy and his mother. The mother wanted to enroll her son in my violin class but had no money to rent or purchase an instrument. I offered to loan a school-district instrument to the boy but found he was too small for any of the instruments in our inventory. The boy had such a hungry look when I let him hold one of the violins. You would think I had just given him a bicycle for Christmas. Fortunately, I knew that Kiddo! funds were available to correct the situation. I went to a local music store and purchased a new violin of the correct size for him and delivered it to his class the next day. It was a crowning moment. He sat proudly next to all the other kids who came to school with their rental instruments. Regardless of whether that little boy is going to grow up to be a concert violinist or a software engineer, he’s going to have the chance. Maybe he will have the chance to do both! How do you choose the music you teach? I try to give kids music they wouldn’t normally listen to on their own. I choose classical music because it provides a historical framework for how western music developed in our culture. Kids are exposed to a lot of pop, rock and jazz, but seldom understand that all these forms had some origins in classical music, which in turn, borrowed ideas from many world cultures. I also try to choose pieces which have “staying power” to the ear. Is it something I’d want to listen to 20 years from now? I want the kids to hear and perform classical music filled with vitality, emotion and profound beauty. You can’t develop a kid’s musical sensitivity unless you expose him or her to the possibilities. Students often ask to play music they have heard from a recent movie or T.V. show, but I learned a great lesson many years ago when I allowed this to happen. The students begged me to teach them the theme to “Jurassic Park”. I felt there was no harm in doing this since the music might motivate my students, so we played it each day in class for a week alongside some selections from Tchaikovsky’s ballet, “Swan Lake”. Within a week, the kids were begging me not to play “Jurassic” because they wanted to play Tchaikovsky. I said nothing to sway their opinion, but the kids concluded that it was more fun to perform Tchaikovsky. When I asked the kids why they rejected “Jurassic”, they responded that it was the same melody played again and again! I realized then that “staying power” music is recognizable at any age. The sad part is that we think that we have to give the kids “popular” music to motivate them. Given the heavy responsibility of educating future music consumers, we need to resist this temptation and to keep our eye on the prize—developing open-minded kids with a curiosity to explore and appreciate subtlety in music. My ethnicity shows, but I also love Chinese folk music. I use some of this to teach my middle school orchestra students about human rights and the meaning of artistic freedom. We seldom think about how music might reveal the social values of a society. I recently brought in an ancient stringed instrument popular in China called the erhu (2-stringed violin) and demonstrated this for the class. This led to a discussion of how Chinese melodies are constructed and inspired by symbols in Chinese culture. Next, the kids watched a landmark documentary film made in 1980 called “From Mao to Mozart” which details the goodwill visit of American violinist Isaac Stern to China. Watching the movie, students learned about the tragedies of the Cultural Revolution, which wiped out a whole generation of musicians. The movie gave the students a greater appreciation for artistic freedom in our own country. The message was a strong one: It could happen to anyone when human rights are not protected. “Arts in Mind” is a series from Kiddo! that explores arts and arts education. Angela Barnett and Suz Lipman are writers and parents in the Mill Valley School District.